Thanks to our reader Catherine who sent us the idea! 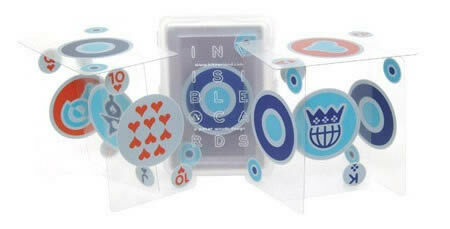 Invisible playing cards are perfect for travel or the beach. They are made of transparent PVC and come stylishly housed in a frosted PVC case. 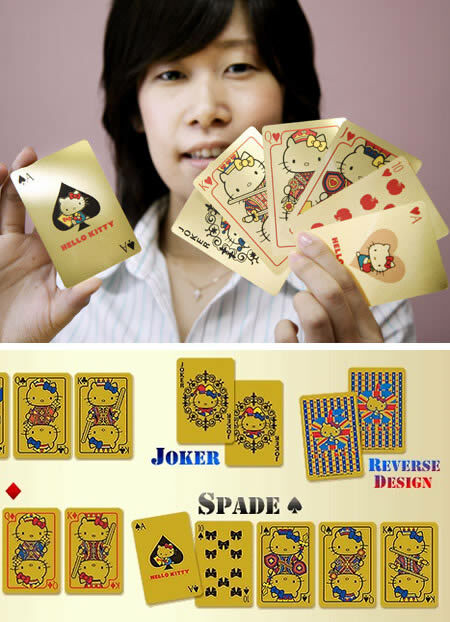 Japan's character goods maker Sanrio lately unveiled the pure gold playing cards with Hello Kitty characters designed over them in Tokyo, on September 28, 2007. The plastic laminated playing cards, produced by Japan's metal company Mitsubishi Material, contains 0.73 g pure gold per card. Sanrio is planning to start accepting orders from October 3, with a price of $4,930 (567,000 yen). The reverse side of the cards shows Hello Kitty against a background featuring the Union Jack and apples, a reference to the fact that Hello Kitty was born in London and is said to be 3 apples heavy and 5 apples tall. 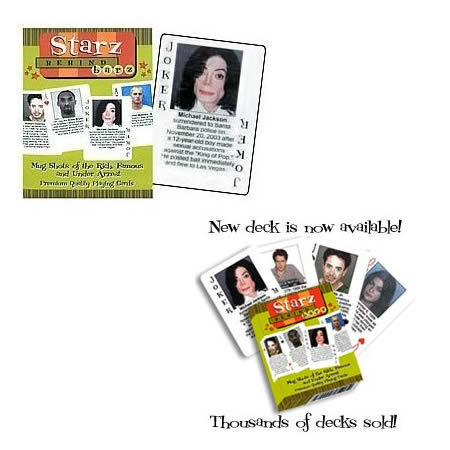 A creepy card deck featuring celebrity mug shots. How about playing poker with MJ and other stars' worst moments? 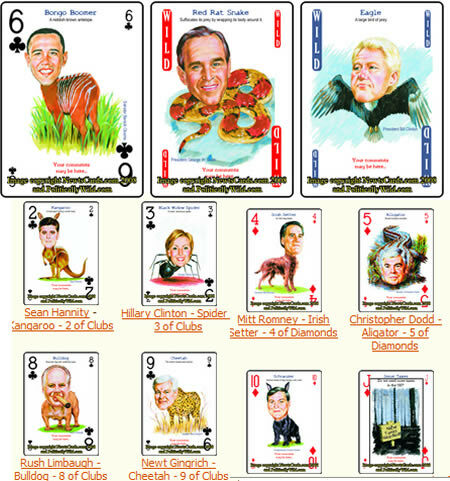 The numbered card faces feature either a politician or a "political celebrity" with the body of an animal. The court card faces (.a.k.a. Jack, Queen and King) have special "issues" that are hot political topics right now. There are two different decks, of course, one being for democrats and the other for republicans. At first this may sound weird, but Alameda County sheriff's came up with this plan as a way of getting tips about 13 decades old homicide cases, which have not been solved. They decided that since the inmates play a lot of cards, this may be a good way to reach out for tips. On each card is the face of the person killed, making for a pretty grisly game of Gin rummy. Tired of the four-sided figure? 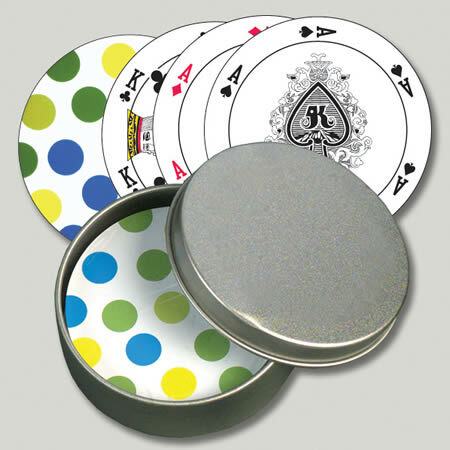 Try this cool round card deck that will make your game much funnier. By US Games Systems, be a crooked card player! 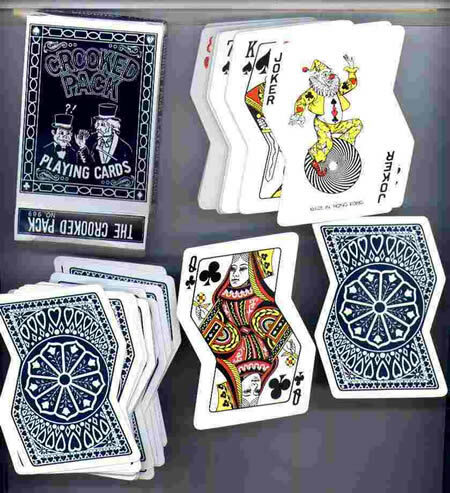 No, don't cheat...the poker-sized playing cards are die-cut in a crooked yet ergonomic shape. 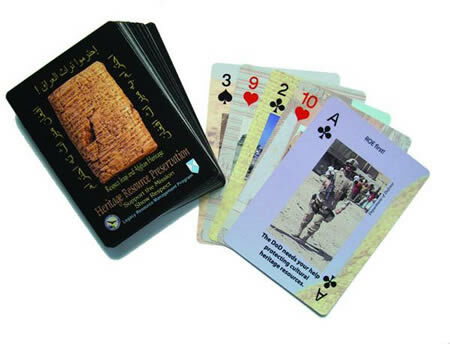 A deck of playing cards with messages about how U.S. troops can protect precious antiquities and archaeological sites in Iraq and Afghanistan was created by Colorado State University and the Department of Defense. Nearly 50,000 decks of cards were distributed in Iraq and Afghanistan and at military installations in the United States. The playing cards were a tool in a wider effort by the Pentagon to prevent damage to ancient sites and to curb the illegal trade of stolen artifacts in Iraq. We think this could be a bit dangerous to have around your poker game if people start throwing cards. 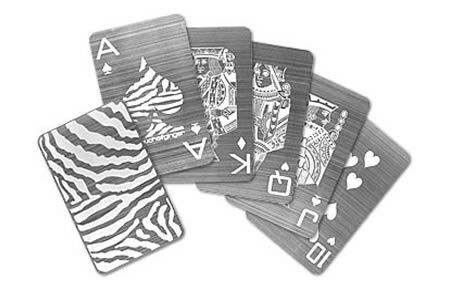 That being said - I like the thought of etched stainless steel playing cards. The card designs are etched into the metal, and arrive at your door in sheets of metal rather than in a deck of cards. The sheets can be displayed on a wall, which would be great for a poker room, or you can press the cards out of the metal sheet, which will leave you with a $313.95 USD deck of standard-sized playing cards. This cool product will enhance your enjoyment of whatever card game you fancy, and increase your knowledge of the Great Bard at the same time. These quality playing cards, feature splendid full color designs in the style of the English High Renaissance. 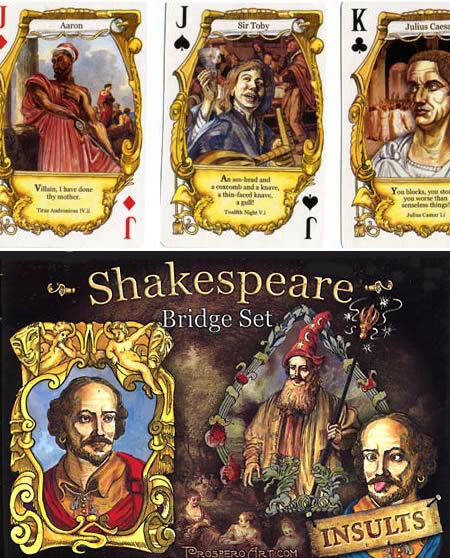 The cards feature a Shakespeare insult on each card, totaling 54 quotes in each deck. The aces, face cards and jokers feature historical pastiches using images from old masters such as Michelangelo and Rembrandt. 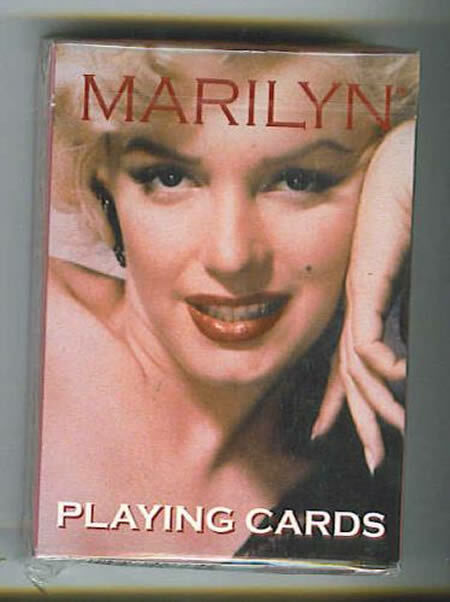 This deck contains Marilyn Monroe images in color and black white! Enough said. Enjoy. A pin-up girl or pin-up model is a model whose mass-produced pictures see wide appeal as pop culture. They are intended for informal display. 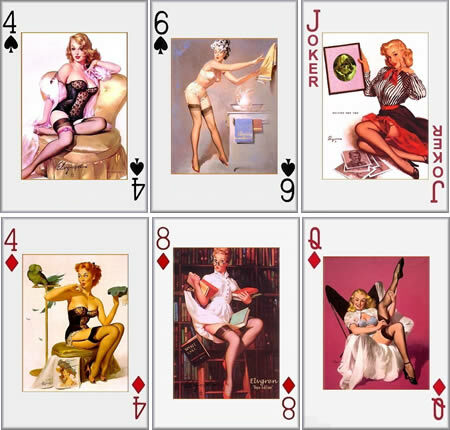 Here you can see photos of beautiful and glamorous girls, actresses and models that were not put only on calendars, or in magazines, but also on many other artifacts that are in everyday use, such as a deck of playing cards. It is provoking and seems like someone on purpose joined these two vices, just to remind us that gambling is also a sin.